Prepacked 75g - 12 packs per box - 10 boxes per case. Countline/Giant – 40 sticks per pack – 24 packs per case. Strawberry Flyers - Strawberry flavoured candy sticks filled with crystallised sugar centres. Prepacked 90g - 12 packs per box - 10 boxes per case. Countline/Giant – 60 sticks per pack – 24 packs per case. 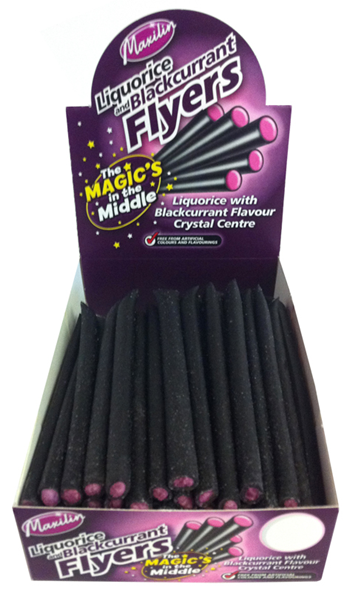 Liquorice and Blackcurrant Flyers - Liquorice stick filled with blackcurrant flavoured crystallised sugar centres. Sour Flyers - Liquorice sticks filled with sour fruit flavoured crystallised sugar centres.